Above: Chief Thundercloud as Tonto in the serial The Lone Ranger (Republic, 1938). Easily the most memorable of the many genuine American Indians who populated the Western serials of the sound era, Chief Thundercloud (also billed as Chief Thunder Cloud, Chief Thunder-Cloud, and simply Thunder Cloud) possessed a strong and imposing screen presence that allowed him to play both villainous and heroic Indians with arresting authority. Powerfully built, with a soft but forceful voice, a distinctive accent, a stern glare, and a wily smile, he could command attention with a minimum of dialogue, conveying a combination of alert ferocity and grim dignity which made even his most sinister characters seem rather admirable–and which also made even his most noble characters seem quietly dangerous. Thundercloud made his biggest mark on the chapterplay genre as one of these heroic-but-formidable characters, portraying an exceptionally capable Tonto in Republic’s two Lone Ranger serials. Chief Thundercloud was born in Oklahoma, back when it was officially known as the Indian Territory; his legal moniker was Victor Daniels, but “Thunder Cloud” was his unofficial family name. His parents were Cherokees, who moved to Arizona not long after his birth; he grew up near Tuscon, where his father found success as a gold miner. Upon reaching young manhood, he became a student at an Arizona mining college, planning to follow in his father’s footsteps; however, he ultimately left school to perform tribal songs and dances on the Chautauqua circuit (this was a sort of alternative form of vaudeville, which sponsored tent shows intended to bring improving entertainment to rural American towns). He then spent time as a prospector, boxer, cowboy, and rodeo performer, before coming to Hollywood during the late 1920s; there, he did stunt work in silent Westerns, and by 1929 had begun playing bit roles as well. He also did some stage performing in California, and worked as a concert singer; he didn’t make his first credited movie appearance until 1935, when–billed as Chief Thunder Cloud–he appeared in the Universal serial The Rustlers of Red Dog. Thundercloud’s Rustlers role was a small but noticeable one; he appeared in several chapters as a hostile Indian named Grey Wolf, the son of a tribal chieftain. Wounded during a raid but sent back to his village by hero Jack Wood (John Mack Brown), Grey Wolf subsequently tried to return the favor when his tribe captured Wood, by convincing his father (Chief Thunderbird) to spare the hero’s life; however, both father and son grimly refused to extend the same clemency to Wood’s sidekicks (Walter Miller and Raymond Hatton), whose Indian-fighting prowess had earned them the dubious “honor” of being burned at the stake. Wood had to resort to trickery in order to save his friends and make his own escape; Grey Wolf evidently considered his debt to the hero paid after this incident–since, when he and his tribe briefly reappeared later in the serial and captured the hero and his friends again, they eagerly made plans to kill all three of them, before being thwarted by another daring escape. Thundercloud delivered all of his Rustlers lines in an Indian language (presumably Cherokee, although he was proficient in several other tribal tongues), effectively using vocal inflections, hand gestures, and facial expressions to convey deep respect for the good guys’ prowess and a bloodthirsty enthusiasm for taking their lives. 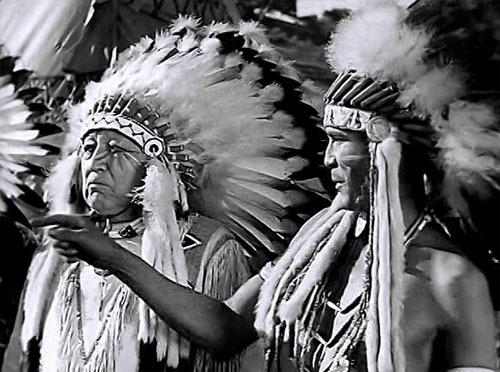 Above: Chief Thunderbird watches approvingly as Chief Thundercloud tells the off-camera Walter Miller and Raymond Hatton that they must die at moonrise in The Rustlers of Red Dog (Universal, 1935). 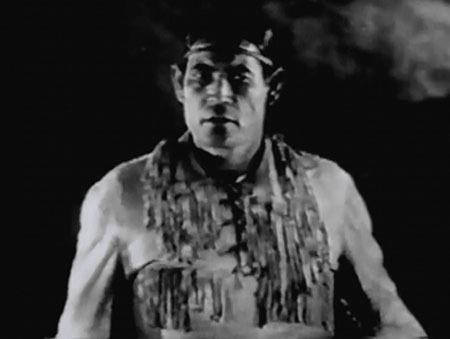 After playing a string of henchman and Indian roles in B-westerns for independent producers like Willis Kent, William Berke, and Louis and Adrian Weiss, Thundercloud took on his next chapterplay role in Custer’s Last Stand, which was produced by the Weisses’ “Stage and Screen” company in 1935 and released early in 1936. A clumsy but interesting misfire, this attempt at a historical epic gave Thundercloud his biggest serial villain role, as a renegade Sioux brave named Young Wolf. The nephew and heir of a revered tribal medicine man, Young Wolf was obsessed with gaining sole control of a sacred medicine arrow that had been left jointly in the custody of himself and his gentle cousin Red Fawn (Dorothy Gulliver); when the arrow was lost in a battle with settlers, he joined forces with outlaw Tom Blade (Reed Howes) to track it down, and dealt ruthlessly with everyone who got in his way, from Red Fawn to heroic scout Kit Cardigan (Rex Lease). Eventually, Young Wolf obtained the arrow–only to accidentally stab himself with it after being confronted by the reproachful ghost of True Eagle. Thundercloud’s character functioned as one of Custer’s principal heavies, and he played the role with intimidating vigor–stalking around like a hungry tiger, frowning angrily or grinning fiercely at prospective victims, and conveying a smoldering resentment towards his rival Red Fawn; he also managed to unexpectedly evoke some sympathy in his character’s death scene, in which he seemed to realize the justice of his ironic fate and made peace with his forgiving cousin. Above: Chief Thundercloud discovers that the coveted medicine arrow is missing in Custer’s Last Stand (Stage and Screen, 1936)–and starts pondering a plan to get it back. Above: Reed Howes tries to smooth over a disagreement with the knife-wielding Chief Thundercloud in Custer’s Last Stand. Thundercloud divided much of the second half of the 1930s between Republic Pictures–where he played Indian roles of varying size in multiple B-westerns, a couple of A-features, and two serials–and the bigger studios Fox and Paramount, where he received several minor roles in A-films (and one major one–the title part in Paramount’s Geronimo). He also made occasional B-movie and serial appearances at other studios, and did quite a bit of radio work during the later years of the decade–appearing regularly as an actor and singer on The Lone Indian, Indian Trails, and other shows centered around Indian history and traditions. The Lone Ranger (1938) was Thundercloud’s first and best Republic serial; this action-packed and dramatically rousing screen adaptation of the popular radio show gave its mysterious title hero a truly mythic origin, as the sole survivor of an ambushed company of Texas Rangers (this backstory was later retroactively given to the radio Lone Ranger). Thundercloud, as aforementioned, played Tonto–the Indian who saved the life of the wounded Ranger and became his ally in his fight against the men responsible for the massacre of the Ranger’s companions–an outlaw turned government administrator and his plundering personal army, who were tyrannizing over all Texas. This high-stakes struggle, much more intense than most conflicts on the radio show, called for convincingly tough and tenacious protagonists–and Thundercloud’s Tonto definitely filled the bill; he wielded knives and guns very effectively in numerous battles with the villains, and gave his character an air of deadly toughness and cunning that made him seem like an extremely useful fellow to have on one’s side. Steely though the Chief’s performance was, however, it wasn’t unrelievedly rigid; without ever entirely dropping his rocklike reserve and catlike alertness, he managed to convey respect and affection for the Lone Ranger and for the group of young Texans who helped him battle the villains throughout the serials–delivering a movingly melancholy chant when one of these assistant heroes was killed, and displaying disbelieving joy when the Ranger reappeared at the end of the serial, after apparently meeting death as well. 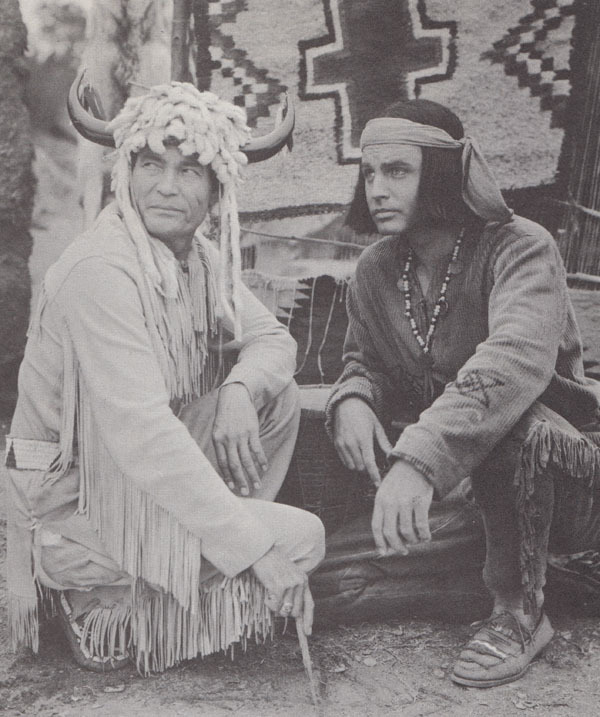 Above: Chief Thundercloud and the Lone Ranger in a publicity still. Lone Ranger proved a very successful serial for Republic, and Thundercloud’s prominent sidekick turn in it firmly established him as a screen good guy, as far as serials were concerned; virtually all of his subsequent chapterplay characters would be sympathetic, or, at worst, misguided. He was both in his next serial, The Great Adventures of Wild Bill Hickok (Columbia, 1938), in which he played an Indian chief named Gray Eagle in three episodes. His character was a friend of Hickok’s (Bill Elliott), but went on the warpath against him and the cattle drive he was protecting when the villains killed an Indian brave and pinned the blame on the said drovers. 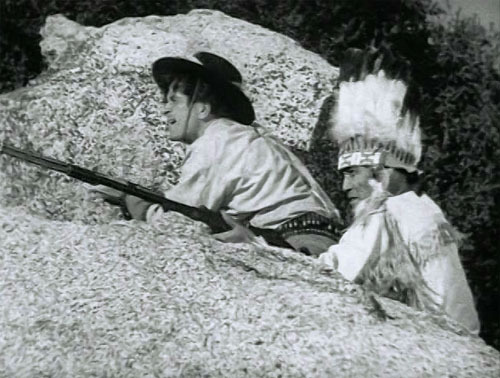 Hickok was captured by Gray Eagle and forced to undergo a trial-by-ordeal, which he survived thanks to the resourcefulness of his young friend Jerry (Frankie Darro); Gray Eagle then made his apologies and called off the war–and made additional amends in a later episode, when he reappeared to lead his tribe to rescue the beleaguered cattle drive from an army of outlaws. Thundercloud was characteristically imposing in this short-lived character role, whether he was grimly confronting Hickok or vehemently ordering his braves to prepare for battle. Above: “War! WAR!” Chief Thundercloud launches into a ferocious battle cry in The Great Adventures of Wild Bill Hickok (Columbia, 1938). Flaming Frontiers (Universal, 1938) featured the Chief intermittently but prominently as a helpful Indian named Thunder Cloud, a skilled tracker and sturdy warrior who periodically served as scout Tex Houston’s (John Mack Brown) sidekick from Chapter Six onwards–helping him hunt for the heroine’s (Eleanor Hansen) kidnapped prospector brother (John Archer), and assisting him in clashes with the outlaws and crooked businessmen who were trying to seize the prospector’s claim. As in The Lone Ranger, Thundercloud was a little reserved but likably friendly in his interactions with the hero, but menacingly tough and crafty when dealing with the villains–particularly when he coldly threatened to scalp conniving henchman Breed (Charles Stevens); he was also convincingly self-assured whenever his character was called on to demonstrate his tracking prowess. 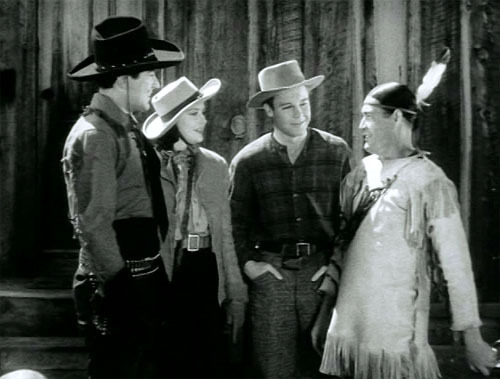 Above: John Mack Brown (far left) introduces Chief Thundercloud to Eleanor Hansen and John Archer in Flaming Frontiers (Universal, 1938). Above: Chief Thundercloud points an accusing finger at Charles Stevens as John Mack Brown covers the henchman in Flaming Frontiers. Thundercloud’s last 1930s serial was The Lone Ranger Rides Again (Republic, 1939), in which he reprised his Tonto role; the Lone Ranger, who had been a mystery man until the final chapter of the previous serial, was revealed to the audience from the start of this sequel, and was played by Bob Livingston. A very well-made serial, but decidedly more pedestrian than its predecessor, Rides Again slightly reduced Tonto’s role by giving the Ranger an unnecessary second sidekick, Juan Valdez (Duncan Renaldo); however, although the Chief had less dialogue here than in Lone Ranger, he participated in more action than the newcomer Valdez did, and still established a strong presence in the serial–once again making Tonto seem forbiddingly tough and cagy, but also genuinely fond of his comrades in arms. 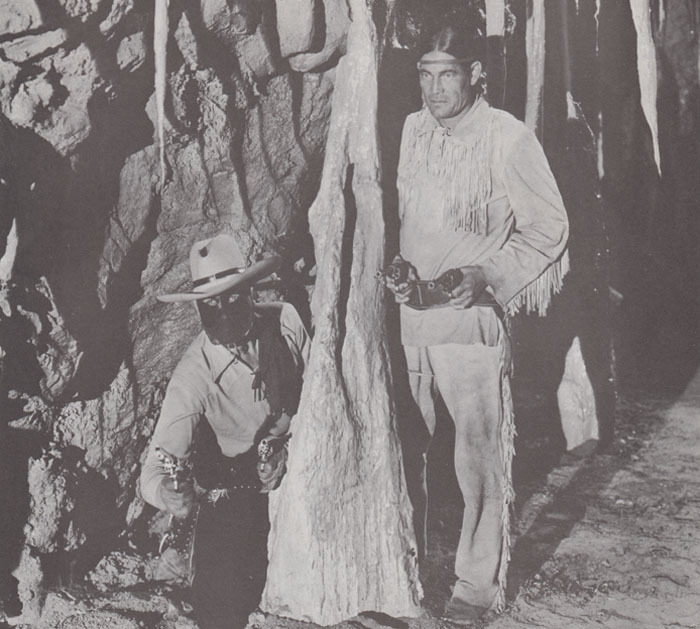 Above: Chief Thundercloud and the masked Bob Livingston get the drop on a cave-full of villains in The Lone Ranger Rides Again (Republic, 1939). The heavies are, left to right, Dave Sharpe, Fred Schaefer, Eddie Parker, Ralph Dunn, Al Taylor, and Charles Regan. 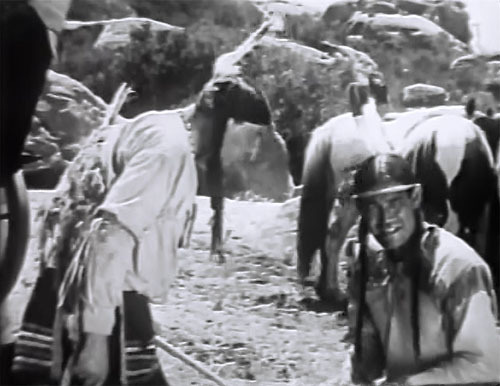 During the first half of the 1940s, Thundercloud received several notable supporting parts in a succession of big-budgeted Fox and Paramount such as Typhoon, North West Mounted Police, and Hudson’s Bay–thanks to the publicity resulting from his two Lone Ranger chapterplays and the above-referenced feature Geronimo; however, he kept appearing regularly in B-westerns as well–now principally at Monogram, where he landed co-starring roles in the one-shot features Silver Stallion and King of the Stallions and in two entries in the studio’s “Trail Blazers” movie series. From 1942 through 1945, he also made several returns to the serial genre; the first of these came in Overland Mail (Universal, 1942), in which he had a one-chapter role as a powerful chieftain named Many Moons. 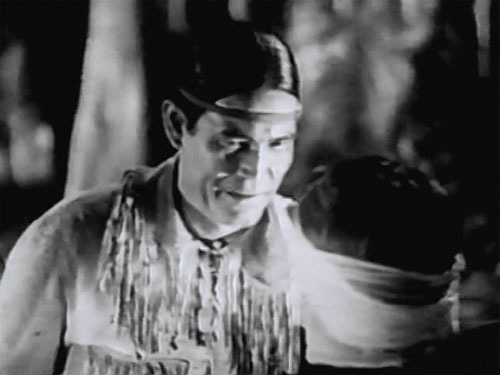 His character made a menacing entrance in Chapter Thirteen–holding a gun on sidekicks Don Terry and Noah Beery Jr.–but soon proved to be an old friend of Terry’s; after introductions were completed, he helped the pair ambush the villains and rescue hero Lon Chaney Jr., then exited the scene and the serial to give the renegade chief Black Cloud (Chief Many Treaties) a fearsome ultimatum in order to make him cease his treaty-breaking activities (“Big chief will scatter his braves all over, like seed in wind”). He obviously (and unsurprisingly ) succeeded in scaring Black Cloud off-camera, since the good guys–who’d been plagued throughout the serial by the renegade’s warriors–were not troubled by them in the remaining chapters. Above: Noah Beery Jr. and Chief Thundercloud fire away at off-camera foes in Overland Mail (Universal, 1942). Thundercloud was a treaty-breaker himself–though not without provocation–in his next serial, The Valley of Vanishing Men (Columbia, 1942); he appeared briefly in two chapters as the grave but pugnacious Chief Tall Tree, who’d recently made peace with the cavalry, and who agreed to let hero Bill Elliott use some of his braves to hunt for the secret headquarters and hidden mine of villain Kenneth MacDonald; MacDonald got wind of this alliance and sent his henchmen to burn the Indians’ village–an action which incensed Tall Tree against white men in general and forced Elliott to leave the village in a hurry. 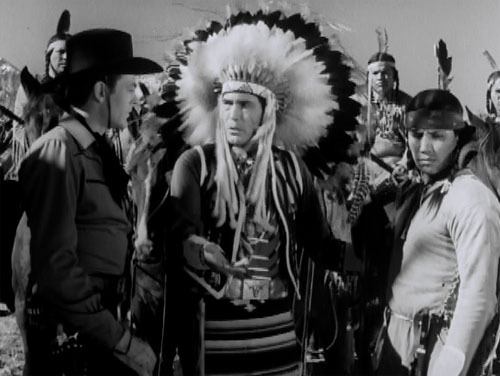 Above: Chief Thundercloud tells his tribe’s best tracker to put himself at the disposal of Bill Elliott (far left) in The Valley of Vanishing Men (Columbia, 1942). Daredevils of the West (1943), was Thundercloud’s first Republic serial since The Lone Ranger Rides Again; here, he figured in episodes Eight and Nine as an Arapaho chief who gave a stage-line work crew permission to cross his land. Villains William Haade and George J. Lewis, who were out to sabotage the stage-line, posed as work-crew members and murdered two Arapaho tribesmen–which caused the angry Thundercloud, seeking eye-for-an-eye retribution, to take heroine Kay Aldridge (the stage-line’s owner) and sidekick Eddie Acuff prisoner and attempt to burn them alive; however, hero Allan Lane managed to capture the real killers in time to stop the fiery execution. Although his character was not actually villainous, according to his own harsh lights, Thundercloud was still pretty frightening in this role–smiling vindictively and scowling implacably as he prepared to carry out primitive justice. 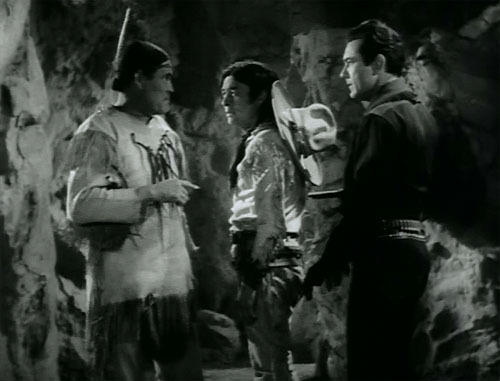 Above: Chief Thundercloud tells Allan Lane (far left) that his slain warriors must be avenged in Daredevils of the West (Republic, 1943). The Indian on the far right is Jay Silverheels–who would later inherit Thundercloud’s Tonto role. Raiders of Ghost City (1944), the Chief’s last Universal serial, gave him his most unambiguously nasty serial part since Custer’s Last Stand; he was cast as a Modoc chief named Tahona, who appeared in the serial’s climactic episodes to lead an all-out assault on a mining town, with the encouragement of a gang of gold-stealing Prussian spies. He was only given a few scenes in this outing, but was still impressively ferocious during his time onscreen; the wolfish gusto with which he tomahawked his Prussian-backed outlaw cohort (Ray Teal), after the latter had outlived his usefulness, was particularly chilling. 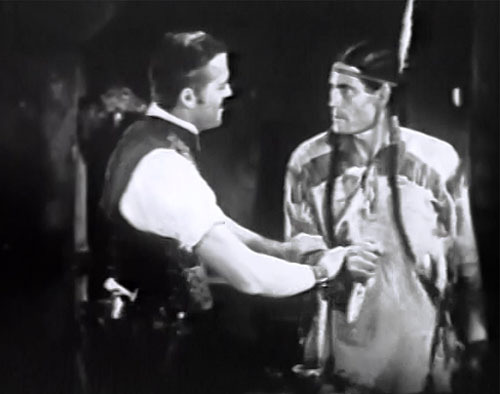 Above: Chief Thundercloud uses a tomahawk to definitively sever his ties with Ray Teal (held just below the frame) in Raiders of Ghost City (Universal, 1944). 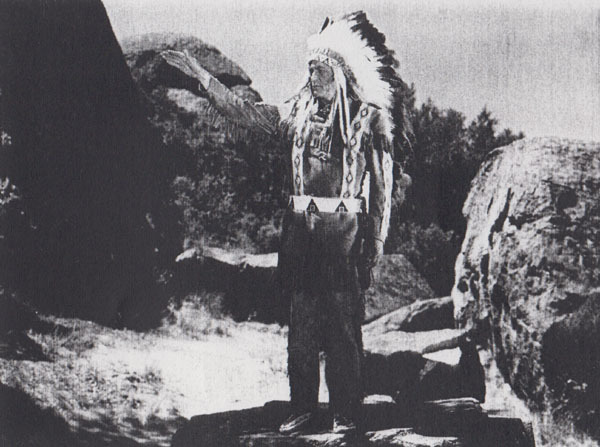 The 1944 Columbia serial Black Arrow gave Thundercloud a recurring character role as a stern Navajo medicine man, who ordered the chief’s son Black Arrow (Robert Scott) to avenge his father’s death at the hands of unknown white intruders by killing “the white man’s chief,” Indian Agent Tom Whitney (Charles Middleton). When Black Arrow refused to slay the friendly Whitney, Thundercloud’s character reluctantly but firmly banished him from the reservation for failing to uphold tribal law; the hero was then forced to track down the real murderer (scheming carpetbagger Kenneth MacDonald) on his own, although he eventually received help from the Navajos when he began getting close to the truth. Thundercloud’s best showcase in Black Arrow came in the first chapter, in which he lent measured gravitas to a description of a tribal ritual and later got to display both deep regret and stern anger during the banishment sequence; he only made three brief appearances in the serial’s subsequent episodes, although he made the most of each of them–presiding with commanding gravity over the attempted execution of Whitney, the questioning of one of MacDonald’s henchmen, and the eventual reinstatement of Black Arrow. Above: Chief Thundercloud and Robert Scott in Black Arrow (Columbia, 1944). 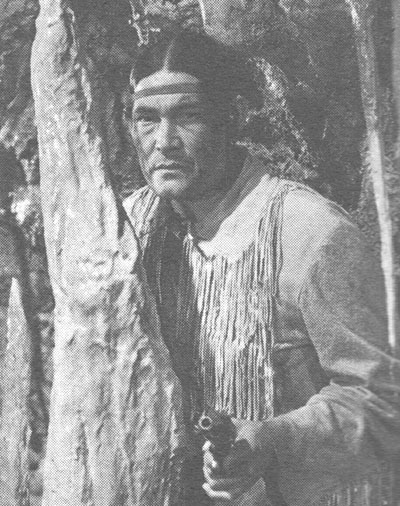 Thundercloud’s last serial was Republic’s 1945 outing The Phantom Rider, which gave him an entirely sympathetic role as Yellow Wolf, the chief of a tribe of reservation Indians. A gang of local outlaws, taking advantage of the reservation’s status as off-limits government land, used it as a base from whence to raid neighboring ranchers; local lawmen were unable to cross into the reservation and arrest them, and the unarmed Indians were unable to drive them out. 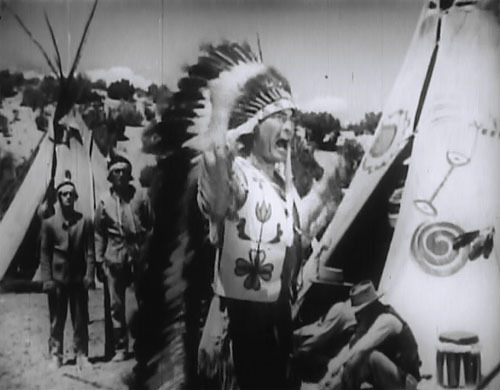 To remedy this situation, Yellow Wolf’s college-educated son Blue Feather (George J. Lewis) set out to win Congressional approval for an Indian police force; his father backed his plan, as did frontier doctor Jim Sterling (Robert Kent), who assumed the guise of an ancient Indian spirit in order to help fight the outlaws–who were secretly being led by the helpful Indian Agent (LeRoy Mason). 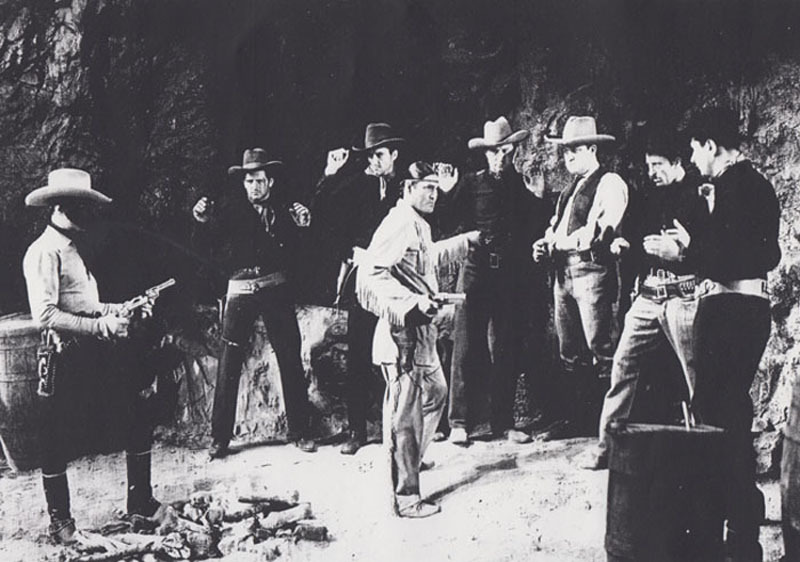 The Chief stayed in the background for much of Phantom Rider, but became temporarily central to the action in several episodes; he survived a couple of assassination attempts with the aid of the Phantom Rider, took part in an extended shootout, and powerfully exhorted his people to support the Indian Police Bill. Thundercloud was characteristically majestic in this part, but a little more relaxed and avuncular than in most of his earlier serials; however, he still showed his customary intensity at times, particularly when he was confronting the treacherous medicine-man Ceta (Tom London) or indignantly vowing to drive the outlaws from the reservation. Above: Chief Thundercloud addresses his people in The Phantom Rider (Republic, 1945). Thundercloud spent the remaining years of the 1940s and the first few years of the 1950s appearing in many B-level Westerns (most of them produced by an outfit called Screen Guild) and occasional A-westerns, among them MGM’s Ambush and Warner Brothers’ Colt .45. A heart ailment caused him to almost completely abandon the movie business after 1952; although he made a few scattered screen appearances (principally on television) during the last years of his life, he devoted most of his time to a steady job at former B-western star Ray Corrigan’s movie ranch and theme park, Corriganville–running a store which sold photos and Indian memorabilia, and performing in the shootouts and other live entertainments staged for Corriganville visitors. The Chief and his wife were still residing at the ranch when he died of cancer late in 1955. 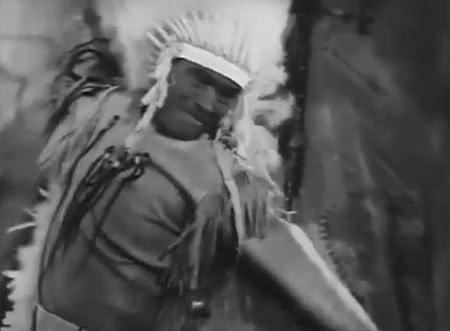 Chief Thundercloud’s tough, crafty, confident, and solemn screen persona made him seem like a veritable archetype, the image of the dignified but wild and incalculable Indian warrior who was first popularized by James Fenimore Cooper and who held a prominent place in the American collective imagination for over a hundred years. This archetypal quality made him a perfect fit for the role of Tonto, one of popular culture’s most famous Indians, and also made him a decidedly awe-inspiring presence in his other serial parts, whether he was helping the hero or opposing him. Above: Chief Thundercloud makes his initial entrance in The Lone Ranger (Republic, 1938). Acknowledgements: Republic’s Lone Ranger press material has surrounded Chief Thundercloud’s early life with some misinformation, but I’ve been able to construct what I believe is a reasonably accurate biography from several sources: the 1930 federal census (which lists his occupation as “Actor–Theatre”), two very useful newspaper interviews with the Chief (one from 1939 and one from 1950), another newspaper blurb from 1938 (which refers to his radio work, and is supported by an entry in the incomplete Radio Gold Index database), his obituary (reproduced in Jerry L. Schneider’s 2007 book Corriganville), and the Old Corral’s Chief Thundercloud page.